Sami Blood: Can You Will Away Identity? Professor Nate Kramer discussed the history, culture and symbolism behind the Swedish film Sami Blood during his lecture for International Cinema. PROVO, Utah (Nov. 7, 2017)—It was not a good time to be Sami in 1930s Sweden. The national parliament had established the Swedish Institute of Racial Biology, whose research was based on the belief that the indigenous Sami people of northern Scandinavia were evolutionarily inferior to the rest of the Swedish population. The film Sami Blood follows Elle Marja, a 14-year-old Sami girl during this period as she is sent to a Swedish boarding school for indigenous children. There, she experiences extreme prejudice and discrimination but eventually decides to abandon her heritage to become part of the dominant Swedish culture with which she is so captivated. Associate professor of Comparative Arts and Letters Nate Kramer discussed the film’s narrow, intimate focus and the historical events it narrates in his lecture for the International Cinema. The film opens with Elle Marja, who has changed her name to the more Swedish Christina being taken by her son to the funeral of her younger sister, Njenna. She appears extremely uncomfortable to be back with her Sami relatives, and refuses to stay the night with her sister’s family, choosing to walk by herself back to the town for a hotel room. The rest of the movie is a flashback following young Elle Marja’s decision to relinquish her Sami heritage. The very last scene, however, returns to an elderly Christina, her heart at last softened toward her cultural roots. These two “bookend” clips of elderly Christina were originally released earlier as a short film by the same director, Amanda Kernell, as The Northern Great Mountain. Kramer describes Elle Marja as “a smart, precocious, daring girl [who] enters a boarding school along with her sister, Njenna, to be taught the Swedish language, culture, and customs.” Not only does she pick up Swedish quickly, Elle Marja is quick to grasp her inferiority in the eyes of her teacher and the other Swedish people in town. In a sharp critique of the racial biology practices of the time, one scene shows a medical examiner measuring her head and nose, and then forcing her to undress and be photographed for scientific documentation. In another scene, her teacher tells her she cannot continue her education in the city, explaining that she does not have the mental capacity and must rejoin her people to keep them from dying out. These scenes reflect the irony that Kramer found so evident in the mindset of the Swedes in the 1930s. “It was alleged that the Sami were . . . inferior to the rest of the population and therefore could not live like civilized people, [and yet] the Sami children are taught, educated in the Swedish language and culture.” The schools were intended to assimilate, yet Elle Marja is told that she and her culture are inassimilable. A unique feature of the film is its narrow, intimate focus. 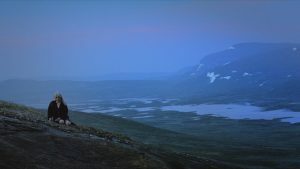 The film does not claim to represent the experience of all Sami; it focuses on the southern Sami people, preserving their language and culture throughout the film. Not all Sami people speak the same language; out of the estimated 80,000 Sami people today, only about 500 speak southern Sami, the language Elle Marja speaks with her family in the film. Amanda Kernell, the director, is part Sami herself and wanted the film to be authentic. She cast Sami sisters Lene and Mia Sparrock as Elle Marja and Njenna. The girls herd reindeer with their family for a living and speak southern Sami. Thus, the film is able to focus solely and specifically on Elle Marja’s experience as a southern Sami in the most authentic way possible. Kramer remarked that the film title—Sami Blood—is particularly poignant as an expression of intangible, inescapable identity. During a scene where Elle Marja steals one of her teacher’s dresses and sneaks off to a dance just outside the town, her distaste for her own culture is evident. Afraid of smelling badly, she washes her arms, face, and neck in the lake, scrubbing at her skin as if to wash away her Sami-ness. A few days later, when she runs away to Uppsala, a Swedish city, she burns her traditional clothing on the train tracks. After decades of bitter prejudice against her own heritage, Christina, as an old woman, eventually cannot help but give in to the pull of her Sami blood, even after a lifetime living as a Swede. At the end of the movie in a particularly poignant scene, she lays her head on her dead sister Njenna’s chest in the coffin as it sits in the church and cries with remorse. She begs Njenna to forgive her and climbs the hills in search of the reindeer herding camp to rejoin her family. Sami Blood is a deeply emotional film that focuses an unflinching eye on the history of the Sami people’s oppression in Sweden and the difficulty of reconciling two conflicting identities. At the same time, the strength of cultural ties is celebrated, suggesting that even the harshest of attempts—by others or oneself—to erase identity can never replace the blood running through someone’s veins. Olivia covers the International Cinema of the College of Humanities. She is a senior pursuing a degree in French language with a minor in international development.